February 1942. A.C. Gilbert Company, New Haven, Connecticut. "Conversion. Toy factory. Stephanie Cewe's skill with this electric screwdriver has been turned to the aid of Uncle Sam's war machine. Stephanie used to assemble toy locomotives; today, she uses the same screwdriver to assemble parachute flare casings." Photo by Howard Hollem, Office of War Information. View full size. Submitted by Chinawanderer on Fri, 06/24/2011 - 8:52pm. 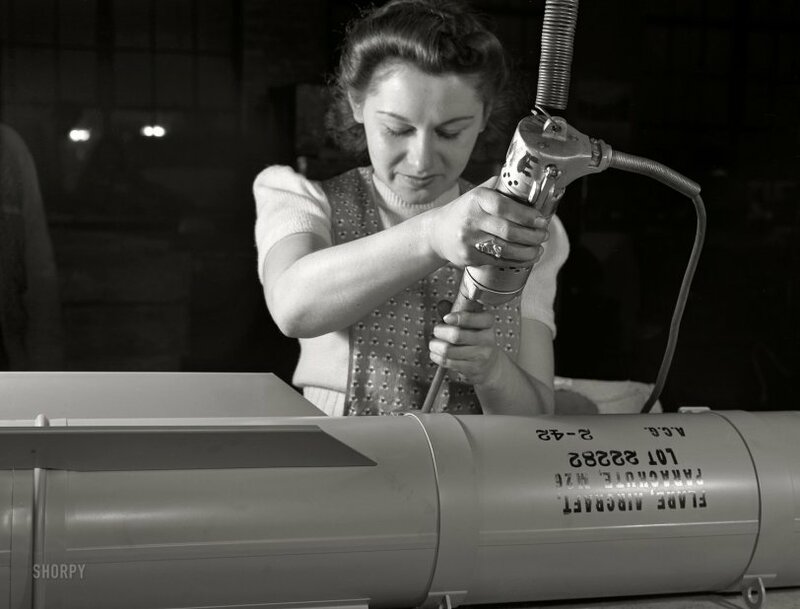 World War II was the second time that AC Gilbert's factory was converted to war production. It was also converted during World War I; Gilbert's brother served in that war. Also during World War I, the War Production Board wanted to cancel the normal Christmas giving of toys to children and replace them with Liberty Bonds. Gilbert traveled to Washington to argue against that idea and became known as the man who saved Christmas. Submitted by Mitya on Sun, 03/06/2011 - 8:35pm. I believe Stephanie was actually known as Stephan until the day the screwdriver slipped. Submitted by Anonymous Tipster on Tue, 09/15/2009 - 7:17am. 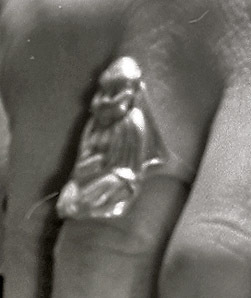 That ring looks like a Buddha, or an angel or a baby. Submitted by Anonymous Mapster on Mon, 09/14/2009 - 5:56pm. Erector Square is still there. The A.C. Gilbert Company was best known as maker of the Erector Set. Submitted by chollisr on Mon, 09/14/2009 - 4:21pm. This lady should be pleased. Countless children were undoubtedly delighted by the toy locomotives she assembled. Equally pleased were Marines and soldiers in foxholes when their aircraft dropped these flares to neutralize the enemy's nighttime infiltration capabilities. Submitted by Rip Tragle on Mon, 09/14/2009 - 2:59pm. I was thinking the same thing about that huge screwdriver. I'm glad he said it as the second photo is delightful. I like the trains too. Submitted by Tom Harwayne on Mon, 09/14/2009 - 2:58pm. One quick look at certain aspects of this picture demands Fark action. Submitted by Brent on Mon, 09/14/2009 - 1:09pm. A.C. Gilbert was making 1/64 scale trains, (O Scale is 1/48, and HO is 1/87) running on O-Gauge track, popularly known as O-27, so yeah, those toy trains were pretty substantial. Those toy trains must have been huge! Submitted by rgraham on Mon, 09/14/2009 - 10:36am. 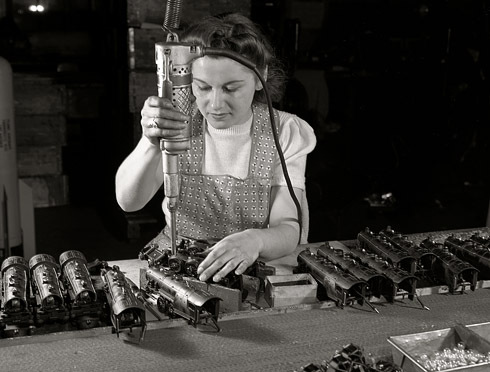 No way she used that "screw driver" to assemble toy locomotives. Nice story though. Submitted by Mr Mel on Mon, 09/14/2009 - 10:34am. There probably was some written or unwritten directive to those OWI lensmen. Photograph only the attractive ones, it's better for the public morale. Submitted by Anonymous Tipster on Mon, 09/14/2009 - 8:12am. Was exercised in the writing of the title for this one! Submitted by GeezerNYC on Mon, 09/14/2009 - 7:46am. Judging by the Shorpy shots from WWll, all the pretty women had factory jobs. Who said working in a factory is boring? One just has to choose the right period in history.